BioDigital Human is an innovative online web application that allows you to easily and effortlessly get new knowledge about human body, diseases and treatments. With its intuitive 3D interface, BioDigital Human offers you unprecedented access to the wonders of human anatomy and medicine. Great Virtual 3D Human Body! If you are student, doctor, or simply enhusiaist, BioDigital Human is the best way to quickly find information on human anatomy, bones, organs, metabolic systems, dynamic conditions, disease states and possible treatments that. You can even created your own custom virtual body, with notes and labes that will help you in your collaborative projects. All in all, BioDigital Human is holding in itself over 5000 anatomy objects from male and female bodies, all collected with the help of expert physicians and scientists. As an added bonus, all those objects hold links to their Wikipedia and NIH data entries, which is an enourmous help if you want to learn more about them. Internet has enabled countless new and innovative ways of sharing information from one user to another, but with the advent of modern technologies, many services found the way to distributing data in visually spectacular and data-rich ways. If you are a interested in understanding human body, or if you are medical student, teacher, physicians, health care professional, academic member or business owner who wants to access top of the line 3D human body anatomy app, you have to take closer look at BioDigital Human. This app features incredible array of tools and services that can fulfill the need of anybody. 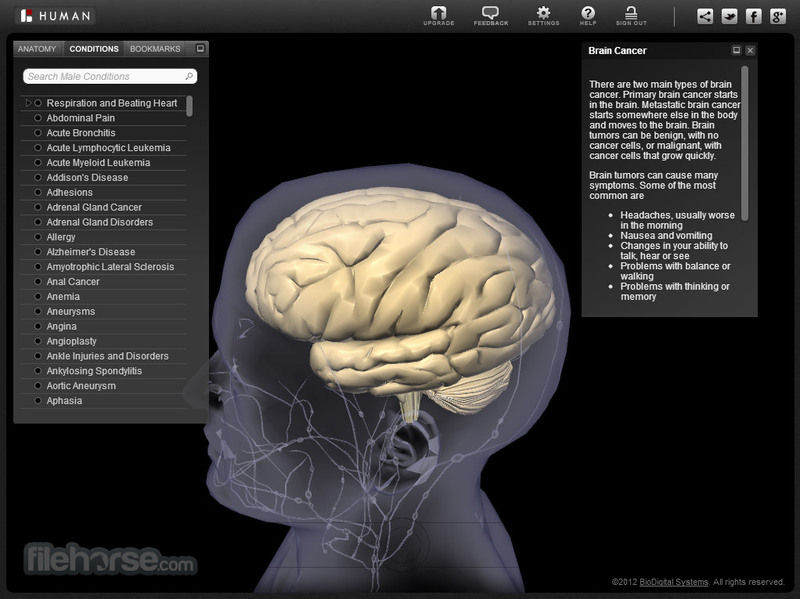 If you want to learn much more about this incredible medical anatomy app, continue reading. BioDigital Human is one of the most advanced and most versatile virtual 3D human anatomy applications that enable everyone from novices and students to seasoned medical personal, and business marketers to take full advantage from this great web-based platform. This versatile cloud-powered app enables effortless access to anatomy learning tools, 3D visualization techniques, exploration of accurate anatomy and health conditions, integrated tools for collaboration and 3D presentation sharing, and finally, fully interactive set of tools that can be used both for business, marketing and learning (interactive quizzes, advanced interactive features, custom branding, access from mobile devices and much more). While many other 3D anatomy webapps are focused simply on discovery of body parts and nice visualization, BioDigital Human has a wealth of data that can be showed for every body part, interactive 3D renderings, database of dynamic diseases and treatments, visualization of medical concepts for patient communication, personalized visuals, interactive 3D autonomy engine, support for quizzes, and fully-programmable API that can introduce new content into BioDigital Human great offering. No matter if you want to use BioDigital Human for personal use, education, information providing and business, here you will find all the necessary tools to make you experience with 3D anatomy as streamlined, engaging and informative as possible. Available with both free of charge and premium paid packages, BioDigital Human represents one of the most comprehensive anatomy tools that you can access online. Interface of BioDigital Human is very professional and expansive, enabling professionals to get informed about every piece of human body, conditions, processes and illnesses. 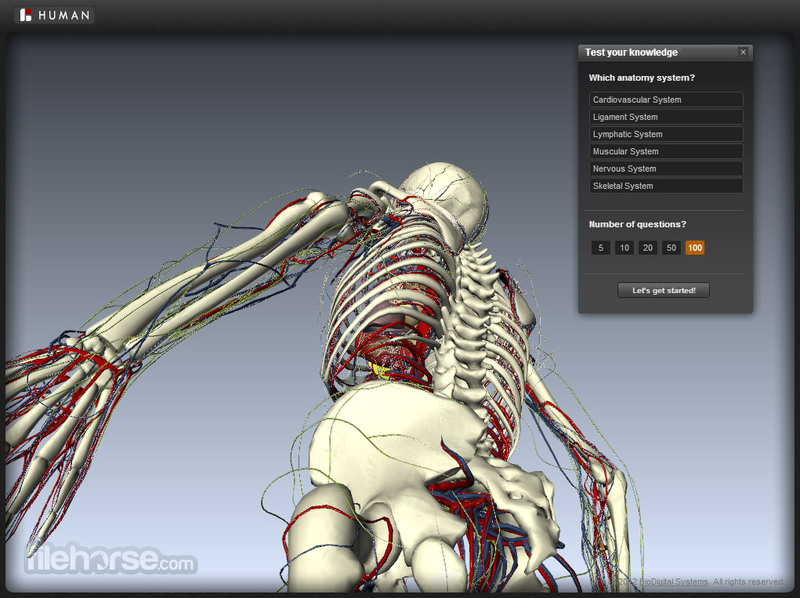 Interface’s main feature is central area where rendering of human body is placed. On the left side you can access many with 3 tabs that can help you locate body part you are searching (or highlight various systems of human body), see database of conditions and review your bookmarks. On the right site is placed information screen that showcases text descriptions of every body part you click on the rendering, including link that leads to Wikipedia and lists of common conditions that can affects that body part. 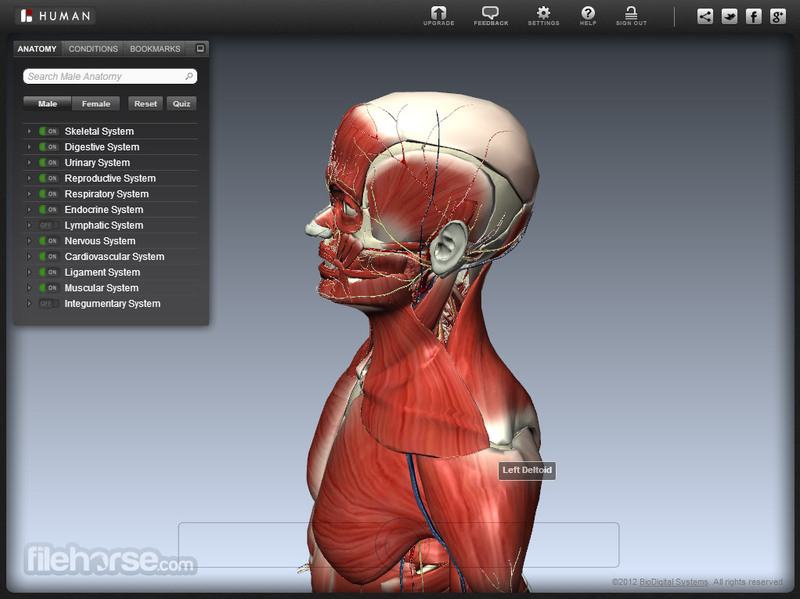 BioDigital Human features 3 tiers of use, starting with a free plan that gives you access to 3D anatomy tool and basic set of interactive features. For $39.96/year you access much more comprehensive Premium Individual plan that unlocks download of images, saving of camera and object states, interactive quiz support, no advertisements, and access to iPhone/iPad apps. If even that is not enough to you, Group & Business plan unlocks collaboration and branding tools, but that plan can be accessed only when your contact BioDigital Human customer support. Premium tier of use can be tested in a 14-day free trial. 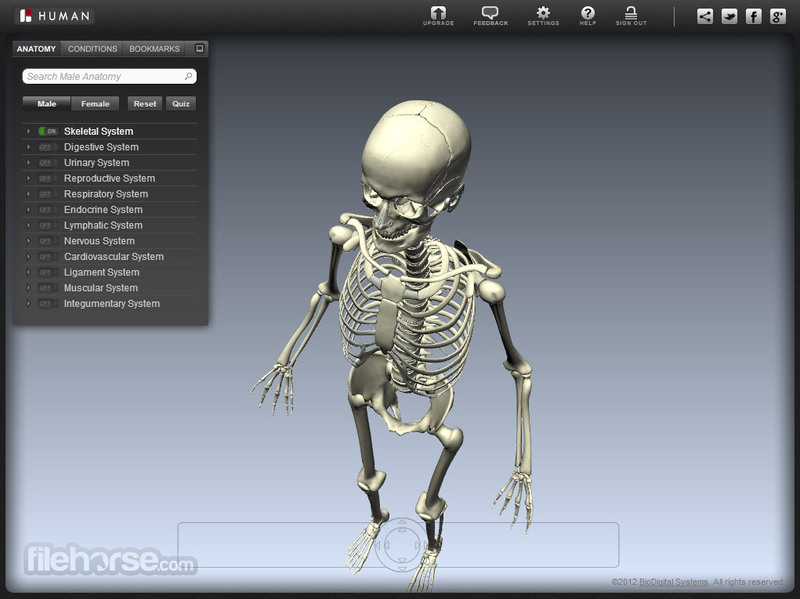 BioDigital Human is oen of the best 3D anatomy apps you can run directly from your browser window. No matter if you are just interested in understanding human body or you are professional who want to learn and share, this app will give you all the tools that you will ever need. Amazing Virtual 3D Human Body! 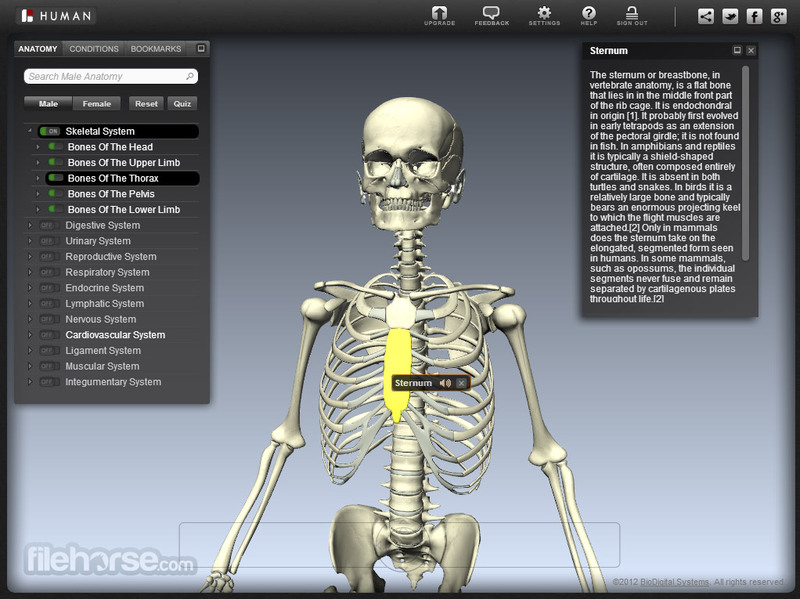 Explore the virtual body in interactive 3D: search, zoom, and rotate objects. Dissect the body and produce custom cross-sections. Create, save, and share annotated screenshots. View dynamic animations of health conditions and disease progression. Add and save personalized text and labels for future reference. Test your knowledge using the quiz engine.